Today Giorgio suggested we take the 360 bus beyond Termini to Piazza San Giovanni to see the "Church of San Giovanni", "Archbasilica of St. John Lateran", "Cathedral of the Pope, "Mother-church of Rome and of the World" and across the way on the eastern side of the Piazza, in front of the Lateran Palace in a separate building, the Holy Staircase. When we arrived, the area was filled with groups of pilgrims and tourists. 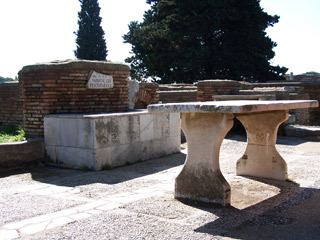 The property and land once belonged to the Laterani family, which Constantine the Great gave to the Supreme Pontiff, Silvester I, who consecrated the first Christian Basilica here in the year 324, dedicating it to the Savior. In the 9th century Pope Sergius III dedicated it also to John the Baptist. Finally in the 12th century Pope Lucius II added the name of St. John the Evangelist to that of the Baptist. Over time the first Basilica was devastated by invading barbarians and suffered damage from fires and earthquakes. It was always rebuilt, repaired, enlarged and adorned. Today it is a glorious sight to behold and why not; the exterior was designed by Alessandro Galilei and the interior by Francesco Borromini. The main façade is a masterpiece. The colossal travertine statues which surmount the façade are 7 meters high. The frieze between the higher and lower porticos declares the will of the Pope and of the Emperor that this temple shall be considered the first, and the Mother of all churches. Six sets of spectacular columns separate the five doors of the principal portico which in turn correspond to the five naves of the Archbasilica. Borromini transformed the ancient Constantinian Basilica with three naves into a vast baroque beauty with five. The central nave is adorned with gorgeous side chapels, enriched with pilasters, niches, marble statues and paintings. High above is a masterful gilded, wood-paneled ceiling. The 4.6 meter stupendous statues of the Apostles along the central nave were done between 1700 and 1719 by various sculptors. Above each niche of the Apostles are 12 stucco bas-reliefs representing scenes from the Old and New Testaments. The four naves are equally stunning, decorated with exquisite art and religious symbolism. The central altar is called the Papal Altar because formerly only the Pope could celebrate Mass there. 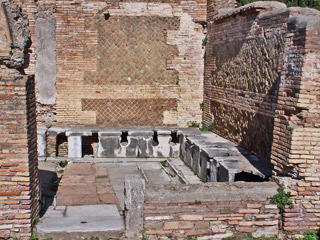 The white marble altar is ornamented with mosaic columns. The elegant Gothic Tabernacle rises above. The tomb of Pope Martin V is in the crypt. The side door to the Archbasilica at the north end of the Transept leads to a double portico with marvelous frescoes and a bronze statue of Henry IV, a benefactor of the church. Above the Loggia delle Benedizioni, the gallery from which the Pope gave his blessing to the people, are the two ancient bell towers. Since the mid-15th century the Holy Staircase has commonly been identified with the marble steps that Christ climbed and descended twice on his way to trial. The Scala Pilati is therefore stained with Christ's blood and the staircase is said to have been brought to Rome from Jerusalem by Constantine's mother and donated to Pope St. Sylvester I who placed it in front of the old Cathedral. 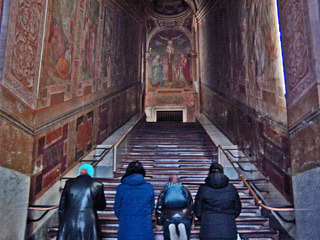 Devout pilgrims ascend the 28 marble steps on their knees. The steps are protected by walnut boards. We passed through the ancient Porta S. Giovanni into Piazzale Appio looking for a lunch spot. There is a police booth in the roadway so we asked the officers if they knew of a good tavola calda. The one who spoke some English directed us to Papero Giallo, at Via Taranto 66 at the corner of Via Aosta 60/C, Tel 06.70.20.546 which they all agreed was the best. Correct! By the way - we have found that the police in Rome are a new breed - friendly, smiling and helpful and some even speak English. A long glass showcase-counter is filled with all kinds of foods, prepared fresh daily. Portions are substantial and prices incredibly low for the quality. Linda had many-layered meat lasagna and I chose baked fish (merluzo) and artichoke, and we shared delicious frappes for dessert (fried dough), one dusted with powdered sugar, the other dipped in dark chocolate. It was a luscious lunch which we enjoyed so much we returned another day because Linda needed a lasagna fix and I wanted to try it. Superb! San Giovanni is a wonderful fun area with a huge daily market (Via Sannio) which starts outdoors and extends into a large covered area. Next door is a Coin department store and the adjoining street, Via Appia is lined with quality shops. "SALDI" signs were everywhere so the jacket try-on count zoomed to 718. Jackets were hanging everywhere in the market. All you need here is your bargaining power  and if youre a hard bargainer, every day is sale day, which did not even come into play: 804 and counting. Shopping these markets is always fun and can be rewarding. There are knock-offs of current fashion trends that can be purchased at excellent prices (after aggressive "negotiation" of course). Just observing the characters that sell and buy and the interaction is worth your time. Bus 360 brought us back home with time to relax a bit before dinner downstairs. The hotel was full so the dining rooms were busy. In addition to the extensive regular menu, the kitchen has been introducing daily special menus, which has resulted in more and more guests choosing to have lunch and/or dinner in house. We opted for tonights specials after starting with awesome penne with four cheeses. Linda had roasted pork with mushrooms and a side of delicious spinach. 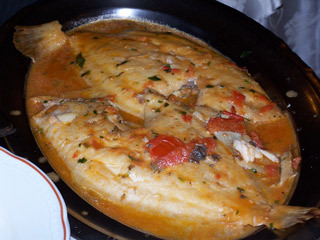 I had a sensational baccalà preparation. The tender filets were baked with bread crumbs, cherry tomatoes, herbs, olives and olive oil. I loved it. After breakfast our host offered his church of the day, the Basilica di San Paolo, one of the five great ancient Basilica's of Rome which was founded by the Emperor Constantine of the former Roman Empire. It was erected over the burial place of Saint Paul the Apostle of Jesus. It was easily reached in 35 minutes by taking the 360 bus to Termini and switching to the metro B (blue) line to the Basilica San Paolo stop, from which it is a 2-minute walk. The ancient basilica was destroyed by fire in 1823 but rebuilding and restoration was made possible by worldwide support. The church is huge, second in size only to St. Peters. We were enthralled by the forest of tall alabaster pillars that are said to have been contributed by Egypt. Pauls tomb is in the center in front of the canopied altar with exquisite, large statues of St. Peter and St. Paul on either side. Near the front altar is the incredible "Paschal Candlestick". Since the 11th century it has had a fundamental role in the Liturgy of Holy Saturday in the area of Roma. This gorgeous marble sculpture is 5.6 meters high and divided into eight sections each of which, through images, depicts some basic themes of the faith and life of believers. 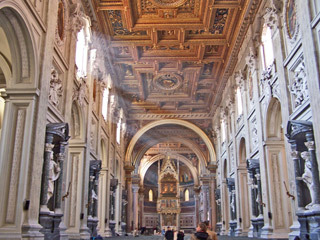 A portrait of every Pope is in a frieze extending above the columns separating the four aisles and naves. Colorful windows high above the side naves have an unusual attractive kaleidoscope design. Two series of mosaics on the interior walls of the nave depict scenes from the life of St. Paul. The stunning cloister of the Monastery of San Paolo fuori le mura was erected between 1220 and 1241. Manicured grass and shrubs are surrounded by graceful twisting columns. 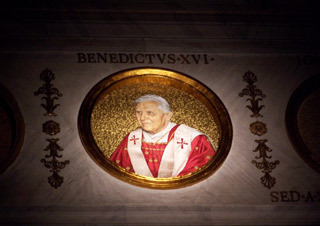 The sacristy contains a fine statue of Pope Boniface IX. We remembered that the Prati area near the Vatican had some excellent shopping streets that might help solve "operation jacket". We took "B" metro back to Termini, switched to the "A" line and proceeded to the Ottaviano station. Our first stop was at the tiny Pizza Rustica at Candia Viale Giulio Cesare, R7 where we got in line to have some of the best pizza al taglio preparations in the city. Margherita and mozzarella with ham made us happy and content and ready for a showdown with "SALDI". Up and down Via Ottaviano, Viale Giulio Cesare and the side streets, the count soaring well over 1000 (or so it seemed). At the end of the shops on Cesare, I told Linda that was it, I give up, just as she spotted one more shop at the end of the block. BINGO, the perfect jacket, negotiations were successfully concluded and we were two worn-out but very happy shoppers. We took the #19 tram at Ottaviano to Piazza Ungheria and from there the 360 bus to the hotel. The public transportation system of buses, trams, metro, trains makes it very easy to get around the entire city. This evening we had wonderful traditional preparations of fettuccini bolognese and penne arrabbiata at the Delle Muse, capping off another day of appreciating the culture and life of Roma. This week-end our long time friends, Fabio and Cornelia would be arriving from their home in Switzerland to celebrate the 10th anniversary of our friendship. We knew they wanted to do some shopping and would be bringing hearty appetites. We had a dinner date for Friday evening, so we spent the day walking around Parioli and the Borghese Gardens preparing our bodies for the heavy wine glass and cutlery lifting ahead. In the evening, we met at the delightful Trimani il Wine Bar at Via Goito 20, for an aperitif before proceeding around the corner to Ristorante da Vincenzo, Via Castelfidardo, 4-6 for a seafood dinner. The whole family was on hand, including Dad whom we had not met previously. Our seafood-loving friends were delighted the minute they saw the antipasti display. It was even better than last time because we were sharing the experience with dear friends - calamari, shrimp, mussels, clams, anchovies, sardines, prepared in various ways - fried veggies, buffalo mozzarella, and the beat goes on. This time we had two variations of fresh-from-the-sea rombo as our second course - baked with potato and baked with spicy tomato sauce. We shared a variety of desserts; panna cotta with frutti di bosco, St.honore, and Mont-blanc plus Grappa and Averna as digestives. The good-natured happy folks at da Vincenzo helped make our first night of celebration a grand success. It usually rains when we meet, but this week-end we were lucky! We met at Termini around noon and started our day shopping along via Nazionale where Fabio and Cornelia satisfied most of their needs. They were anxious to see the restored Pantheon and were properly impressed. As we do, they love to wander and soak up life on the streets of this intriguing city. Slowly, slowly, up Via del Corso, we navigated through the picturesque boutique shopping streets running east, past the Spanish Steps and continued to Piazza del Popolo. We crossed Ponte Regina Margherita into Piazza d. Liberta and turned left on Via Feder Cesi to Piazza Cavour to savor the imposing Palace of Justice. The massive building fronts both the Piazza and the river. We have admired the building from across the river for years but this was the first time we saw it up close. It's a powerful piece of architecture that commands attention. I was particularly awed by the enormous size of the stones but can see how the size of the building demanded this design element as well as the exaggerated decorations that grace the façade. 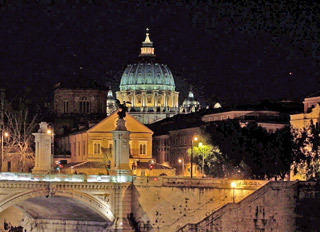 It was now dark and the Castel St. Angelo and St. Peters were aglow in their flood lights. We crossed the Ponte Umberto I to allow Linda to get great shots back across the river. We crossed the river again on the beautiful Ponte S. Angelo. We proceeded along Via d. Conciliazone to Piazza S. Pietro for some close-ups of the Vatican and then proceeded north on Via Angelica, Via Ottaviano and after crossing Giulio Cesare turned left to Via Otranto on the right for dinner at Perilli in Prati at number 9-11. As always Massimo was at the door greeting his customers with a big smile and handshake. We had been here last year with Cornelia (Fabio had been ill) and to our delight she requested that we return with Fabio this time. Massimo had decided to change the environment from its original contemporary design to a more traditional ambiance. In addition, he has added a larger seafood and fish selection to the menu. The only problem is that it makes the decision-making that much more difficult. Our very first visit we sampled the long list of traditional appetizers and pasta. The next time we chose from the ancient Roman recipes. We had not yet tried the grilled meats and now choices from the sea. Tonight Linda and I decided on traditional and old Roman. Fettuccini al sugo di cinghiale and carciofi alla romana to start, followed by costata di vitello (grilled veal) for Linda and abbacchio alla cacciatore (lamb stew) for me. Between courses Massimo brought us a small tasting of spaghetti with calamari dressed with olive oil, basil and olives. It was well worth walking for 8 hours to arrive hungry for this exquisite meal! 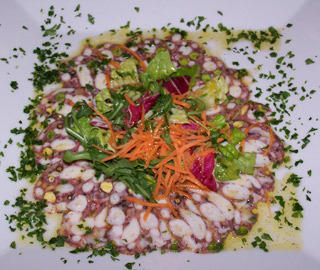 Our friends started with raw tuna and carpaccio of octopus as appetizers, which they loved. Somehow I failed to record their secondi and my memory is blank but be assured, they were pleased. The Collio Chardonnay and house red were excellent as was the hot thin focaccia laced with olive oil and herbs. Fabio had asked us to find a cozy typical Roman trattoria for lunch on Sunday. His long time friend would be joining us with his girl friend. We decided that Settimio Pellegrino, Via del Pellegrino would fill the bill perfectly. Mom was in the cucina, Dad was patrolling the front, the staff was bustling about and soon number two son (the doctor and comedian) would show up to help out. One is not rushed here; its an ideal spot for a leisurely lunch with friends. The place was fully booked with locals, obviously regulars. We were happy we had reserved. Freshly made fettuccini with tomato sauce and grated cheese was the only pasta today - better than weve ever had. Everybody had the grilled meat balls, except me. I had divine roast baby lamb. Garlicky roast potatoes for all put us on an even footing. The one dessert was a treasure, Mont blanc, whipped cream, vermicelli (noodles of chestnut puree), pieces of chestnut and meringue. After lunch and fond good-byes, we went our own way and our friends headed to the airport. We took the #62 bus from Corso Vittorio Emanuele to Piazza Barberini, where we disembarked and walked up Via Veneto, through the Borghese Gardens and headed home. Via Veneto had the usual gawking sightseers while the garden was crowded with walkers, strollers, runners and four wheel rental bikes (talk about dangerous drivers). Just before reaching Piazza Ungheria, I spotted a smashing jacket in a store window which I called to Linda's attention. It said SALDI and even though one had already been procured, the price was so attractive it begged attention. It looked smashing when she tried it on and even though the price was very good perhaps it could be better. The father of the owner was on duty and between not knowing English and not having the authority to discuss price, he called his son and Linda conducted the negotiations over the phone - what a blast! Linda now has two new jackets, which is okay because along the way yours truly managed to find a splendid pair of SALDI shoes. By the way I don't think I've mentioned that the national headquarters of Italy's national police force, the Carabinieri, is located just down the street from Hotel Delle Muse. I really love their uniforms, especially the grand capes. There is always an official car parked across from the buildings with two armed guards that we pass when walking or on the bus; I greet them with bongiorno or I wave from the bus, to make Linda laugh. I am hoping that one of these days they invite me to be an honorary member of the force and reward me with a uniform - with a cape! :-) OK Ill settle for a personal tour of their headquarters  and an official calendar. While our appetites were a bit diminished from the large, long lunch we were able to do justice to the Delle Muse "Big Salad", lots of greens, radicchio, arugula, tuna, mozzarella, olives, and tomato served in a large glass bowl. Twenty-seven kilometers from Roma are the ruins of Ostia Antica, the ancient port city of Rome. The town was established at the mouth of Tiber (thus the name Ostia, from ostium - river mouth) as an important port for Rome's trading (particularly grain) and as a military garrison. Over time there was a decline in the trade and commerce of the port and the town was eventually abandoned. The slow death and burial (helped by tidal waves of mud) resulted in well-preserved building stratifications. Excavations started in the early 1900's and today approximately 60% has been unearthed. We have been coming to Rome for about 25 years and sad to say that it had taken us this long to visit the one place to truly understand and appreciate ancient Roman town planning for a real life working city, unlike Pompeii, which was a resort. The remains are substantial and well-preserved and the descriptive signing along the way is very informative. It didn't take us long to feel that we were a long way back in time. The main axis of the ancient city is Decumanus Maximus which runs from Porta Romana (facing Roma) to Porta Marina (facing the water). This main street, paved with huge smooth stones, leads the way into the extensive ruins of the urban structure. Since trading was the major economic driver it had a distinct influence on the city planning. There was an abundance of warehouses and storerooms. The "Tempio dei Fusi Navales" was a building for the shipwrights guild and the "Schola Del Triano", the shipwrights' school. Numerous other buildings were dedicated to other guilds. The imposing "Square of the Guilds" or the "Corporation's Forum", about 107 meters long and 78 meters wide, housed the offices of ship owners, guilds and traders where day-to-day business was conducted. Floor mosaics, depicting the area occupied by each of the various businesses, remain. The population was made up of people from around the world of different cultures and customs. There were nine religious buildings for the oriental faith and just outside Porta Marina, there are four columns of the first Jewish Synagogue and the area of the ancient Jewish community, which was founded during the reign of Claudius (41-54 CE). The ancient Forum was dominated by the large basilica, Tempio Rotundo, with a huge front porch, a Temple to Jupiter and a Temple to Caesar Augustus. This diverse group knew how to live; it was not all work and no play. Adjacent to the "Square of the Guilds" are the spectacular remains of a Roman Theatre. Tall handsome brick archways lead to tiers of seats, the orchestra pit and stage. Performances are held here in the summertime to audiences of about 2700. For relaxation there was the Terme del Foro, the main bathing and central heating area with hot and cold pools and a sauna. Women would go in the morning and men in the afternoon. Physical fitness was looked after in the large gymnasium. After everyone was completely relaxed they would adjourn to the pub for grilled foods and wine. 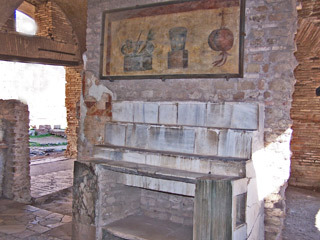 It was amazing to see this beautifully-preserved spot with the original marble bar, grill, and marble shelves with frescoes above illustrating the products available. There is a backyard patio with a wine cellar beneath it. Another building had well-preserved mosaic floors with boxing and archery motifs. It is thought this was a place for the boys to have a few drinks and talk sports and politics. The rich merchants had lovely villas with attractive courtyards, pools and saunas. One even had a private toilet room. That was the only private one we saw, but we also saw public toilets, which could seat 24, knee to knee, reminding me of my days in the military. The public toilets provided jobs for many people as well as efficient waste disposal; the collected goodies were recycled as fertilizer. Let's get back to housing. There are blocks of beautifully-built apartment buildings, 4 and 5 stories high, usually built around courtyards; most had balconies, in three different types. Each housing zone had five services provided; terme, fountains, baths, laundry and police. Caserma dei Vigili, the police compound, included the five basic services plus the police station, toilets and a place of worship. There is evidence that the population did not suffer from thirst or hunger. There were many fountains throughout the city all linked to the aqueduct which insured an excellent water supply. Black and white fish and maritime mosaics and stone cutting tables indicate the location of the fish market. Since grain was the major import at the port, there was a miller and baker side-by-side. "Molino del Silvano" was the only milling business and "Panificio di via dei Muline" was the only baker who supplied the town and sold to Rome as well. 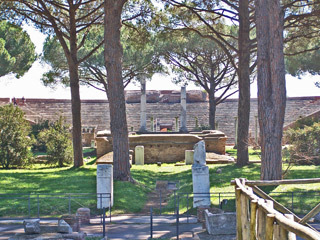 Ostia Antica is unique and stimulating, not far from central Roma and accessible by public transportation. We urge you to put it on your must-see list. After the stirring day we decided to have a relaxing dinner at Perilli in Prati, Via Otranto 9-11. The appetizing display of fresh meats begging to be grilled looked awfully good. We left it to Massimo to choose our menu and sat back and relaxed, enjoying the wonderful thin focaccia laced with olive oil and the house white wine. We have never had pizza here (the real food is too good) but were enthralled by the beauties being delivered to the nearby tables; another reason to return. The tartare di tonno tiepida con emulsione de limone with capers (an eye catching arrangement) of raw tuna, chopped vegetables flavored with lemon and capers) was chosen for me and spaghetti alle vongole veraci (clams in the shell) for Linda. When it's this good we do our "eat slowly, it will last longer" routine. Between courses we shared travel talk with a British couple sitting next to us. Actually, we have met many folks visiting from Great Britain - the pound goes a long way against the euro. Linda enjoyed tagliata argentina with balsamic, arugula and artichoke while I savored a veal steak with roast potatoes and chicory. After gelato and a chestnut, caramel and warm chocolate parfait it was good night Massimo - until next year. Italy has something for everyone, every season. We will savor our memories of Winter in Italy 2006 - until next time.